Some customers just won't pay, no matter what you do. What do you do? Most businesses operate on a cash accounting basis, which means you don't have the income if you haven't collected the money. But you have done the work if you're a service business, or you delivered the product if your customer is another company. You must find a way to track what is owed to you and how much is owed, so you know what is outstanding and needs to be collected. Even if you have a very small business, you will find yourself in the position of having to collect from customers. You should have run an accounts receivable analysis, so you can see who hasn't paid and how long the money has been outstanding. Make a list of the accounts that you haven't heard from, even after several attempts to contact them. Understand what you can and cannot do legally, to interact with customers to get them to pay. Small claims court, which allows you to go to through a specific type of court to bring someone to court for non-payment. Collections agencies are companies that attempt to collect debts. They receive a percentage of the amount collected, which could be as much as 25% to 45% of the debt. Collections agencies use phone and mail to contact non-payers. In situations when a debtor is difficult to contact, they might use a private investigator or internet searches. These agencies must obey all debt collections laws and should not use abusive tactics to collect. 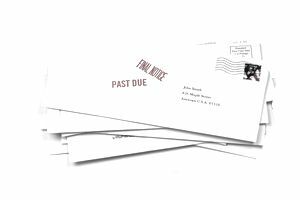 Some collection agencies are connected with attorneys; having the advantage of being able to send a letter from an attorney to debtors. Collection agencies are a good choice if you can't locate the customer if this person has moved or is no longer a customer. Some collection agencies use more forceful tactics, so check a potential agency by contacting previous clients. Collection agencies may be a possibility if a non-paying customer is still active because you can continue with the customer on a cash basis while distancing your business relationship from the collections process. If you do get paid through the effort of a collections agency, you will only get a portion of what is owed. That's still better than nothing. The small claims process is for the express purpose of bringing two parties together without the need for attorneys or a lengthy trial. Your company files a claim, and you and debtor appear before a judge who hears both sides. The judge then makes a judgment (a court order). The small claims process is fairly easy to navigate for small businesses. You will need good records of work done or products delivered and of non-payment and attempt to collect. The small claims process is still confrontational, meaning that it brings you into conflict with the person who owes you money. If this person is still a customer, that can be difficult. It's best to use small claims actions for debtors who are no longer active customers. Getting a judgment against a debtor is fairly easy if you have the records. But getting a judgment doesn't guarantee that you will get paid. You may have to go back to the judge for additional court processes, and there is still no guarantee that you will get paid, and it may take a long time to get paid. How much and how soon you need at least part of the money owed to you.